A natural, reusable and eco friendly alternative to plastic wrap. 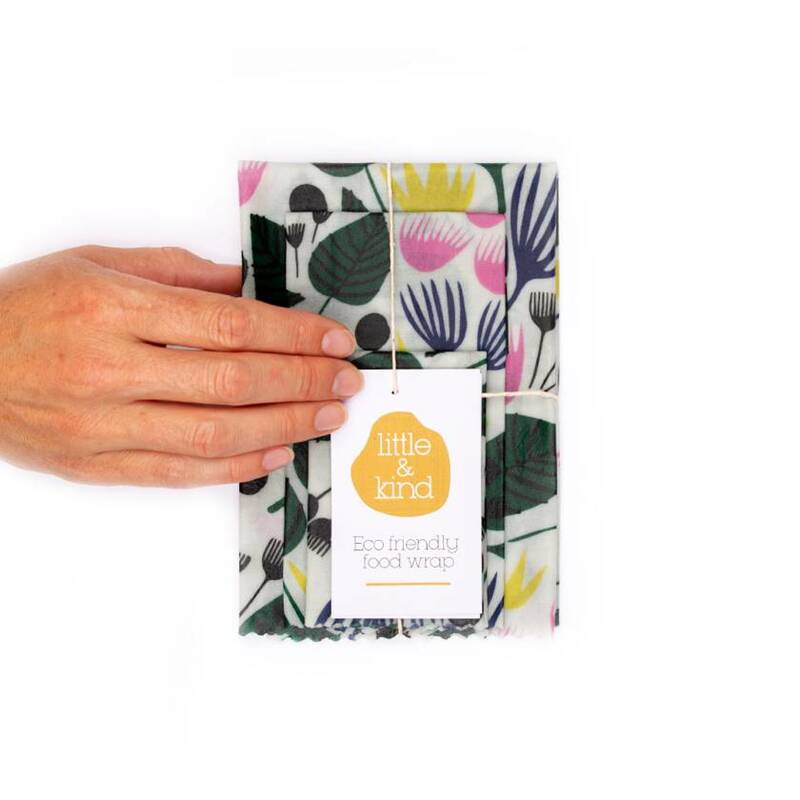 little & kind wraps can be used for a variety of food storage from covering bowls to wrapping sandwiches or keeping leftover fruit and veggies fresh. 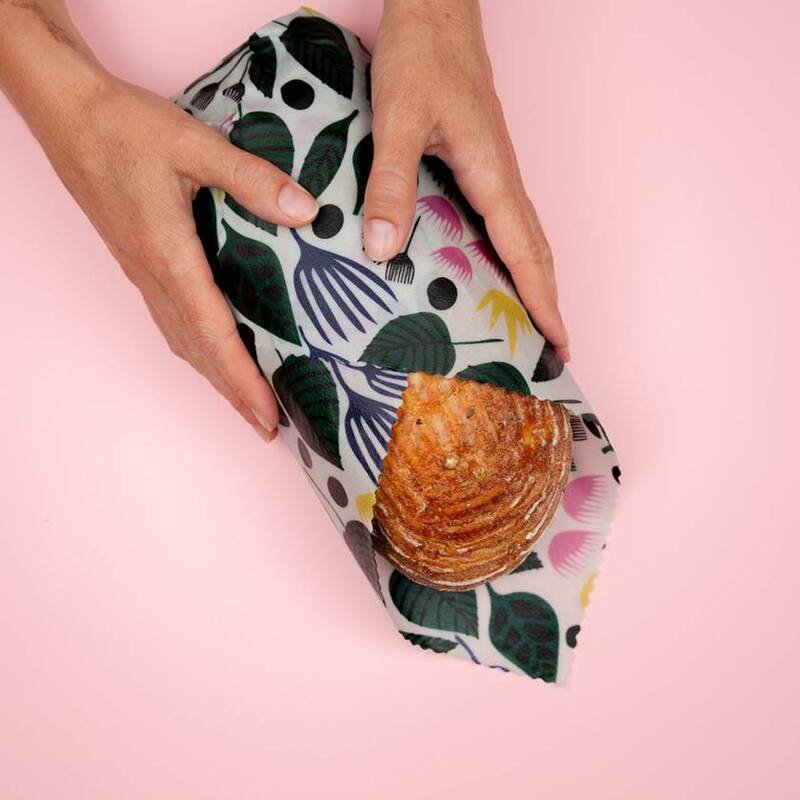 Our wraps are lovingly handmade in Auckland using 100% cotton, New Zealand beeswax, tree resin and organic coconut oil. They are tacky and easy to shape around bowls and food, plus you can even make into snack pockets or cones. -Large (approx 33x35cm) - use for salad bowls, big sandwiches, veggies like pumpkin, larger blocks of cheese and more. The ‘Canopy’ fabric is from Texas based illustrator Leah Duncan’s latest collection, Wild. 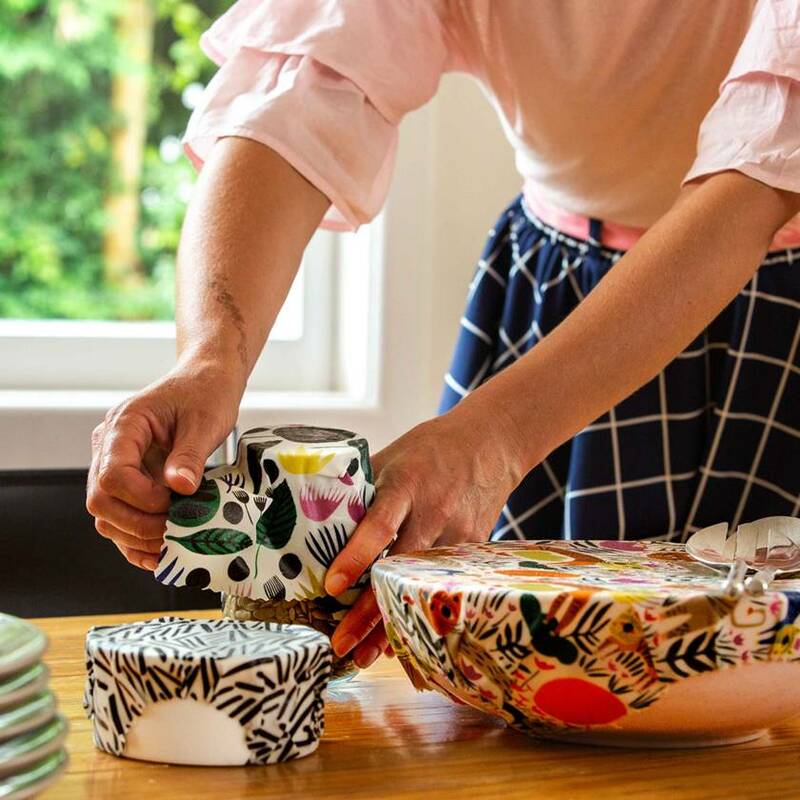 Inspired by her love of nature, this print features floral botanicals in her recognisable style - mixing simplicity and beauty with quirky organic themes. This fabric is 100% organic cotton. Simply use the warmth of your hands to mould and shape the wraps. Not suitable for oven, dishwasher, microwave or to cover raw meat. Simply wipe using a cloth with cold water and mild eco detergent if required. If using detergent we recommend an eco friendly option as they are free from alcohol, which can damage the wraps. Once clean, drip dry on dish rack or use a tea towel to pat dry. Please avoid anything abrasive as this will damage the beeswax coating. They are best stored in a cool dry place. Our wraps last 6 to 12 months depending on how frequently you use them and if you follow the care instructions. Over time and with use the wraps will lose some stickiness but all you need to do is use the warmth of your hands and press a little firmer. Also the zig-zag edging we add means our wraps will not fray. Our wraps are designed to be used and enjoyed - so they are likely to get creases and marks. If you want to minimise this, do not use for strongly coloured foods such as beetroot. But don’t worry if they do get marks as this does not affect how well they work (and we think simply adds to their character!). Contact littlekindnz to enquire about payment or shipping options.